Emergency Lawn Sprinkler Repair in Atlanta is just one phone call away “770-900-9862”! We at Atlanta Sprinkler Repair know all too well that your irrigation system can come on at any time, and you may not be able get it to stop running without cutting off the main water supply to your house. This is something that happens quite often if you have failed to get your Irrigation system winterized before the first freeze. 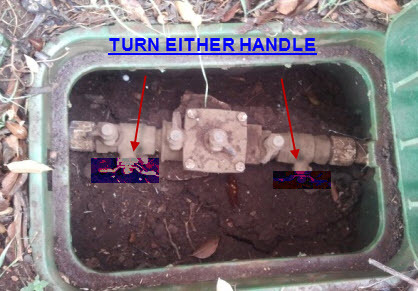 If you have unplugged the controller and it does not stop the system from running, the issue with your sprinkler system is most likely not related to the timer. It is most likely the electric valve in your system that operates the zone that continues to run. To turn the system off at the water source, you will need to locate the MAIN EMERGENCY CUTOFF for the sprinkler system. This will turn off the water to your sprinkler system without turning off the water to the entire house or building. In Atlanta this MAIN EMERGENCY CUTOFF should be located within three feet of your water main that supplies the water to your home or building. If you have not winterized the system in a few years the grass may have grown over the round box where your EMERGENCY CUTOFF is located. If this has happened then you will need to get a long screwdriver and poke around within the three foot area until you hear a hollow thumping sound that should be the plastic top to the box. If you can’t locate the EMERGENCY CUTOFF, give us a call at Atlanta Sprinkler Repair “770-900-9862″ and if we can’t help you find your cutoff over the phone, we will get an Irrigation Technician out ASAP!! !